I hope you're all having an excellent Wednesday! Today I have some swatches of NYC's Purple Pizzazz Frost to show you all. Purple Pizzazz Frost is a royal purple color with lots of navy blue shimmer in it. All of the shimmer made this really difficult to get pictures of, so I feel like my swatches look slightly more blue than what this polish looks like in person. I usually have problems with some NYC polishes being really watery and streaky, but this one applied great. It went on really smooth with no problems at all, and I just had to use two coats. I purchased this for $1 at Target. I’m super excited today, because tomorrow my sister and I are going to Chicago. We’re just going there for a little trip to relax before we start our fall schedules and get really busy. We’re going there tomorrow morning, and will be returning Saturday night, so I don’t know if I’ll be able to post anything on here for the next couple of days. I might if we have some down time, but I guess we’ll see. Anyway, today I have some swatches of Julep's Alfre to show you all. Alfre is a dusty blue/purple frost. This is a really streaky polish, so I ended up using three coats of it to try to minimize the streaks. I have some other polishes that look just like this one, and with the streakiness, I don’t think this is one that I will be using a lot. I got this polish from my Julep Maven box, and this is not available until Fall ’11. As I mentioned yesterday, I just got my first Julep Maven box and was sent the polish Cameron. Cameron is a very bright pink creme. It's not so bright that it's a neon, but it's definitely brighter than the majority of other hot pink polishes I have. I think this color is really pretty, and it's definitely something I could see myself using year round. This polish was a little bit thick and hard to get completely even on the nail, so I ended up having to use 3 coats. The only complaint I have about Julep polishes so far is that the wand was dripping polish all over when I was trying to apply it. I've never had this happen to me with any other brand before, but it wasn't that big of a deal since after awhile I learned that I had to scrape the wand along the inside of the bottle as I was pulling it out to prevent this from happening. Yesterday in the mail, I got my Julep Maven introductory box! (I have seen quite a few blog posts about this, so I'm not going to go into a lot of detail about what the Julep program is.) The quiz that I took to determine my style on Julep said that I am an “American Beauty.” So, this month I was sent the polishes Alfre (this is a new Fall ’11 color and isn’t released yet) and Cameron, a base coat, and a hand scrub. The Julep polishes are in a really pretty long bottle and each one contains .27 fl oz. If I were to have purchased these polishes outside of the box, they would have cost $14 a piece, which I think is pretty ridiculous considering most polishes are .5 oz and cost about $8. I haven’t been able to try out the polishes yet, but I should have swatches of Alfre and Cameron for you all in the next couple of days. *All members of Julep Maven are given a referral link that will give them a $15 gift card for every person they get to sign up. I hope you all had a fabulous weekend! I'm already getting really excited for this upcoming weekend, because this Friday and Saturday my sister and I are going to Chicago. We're going to hang around the city and shop a little bit, so it should be fun. Today, I have a couple of swatches of Sally Hansen's Platinum from the Diamond Strength line to show you all. Yay, it’s Sunday! I hope you all have had a great weekend so far. Today I have some swatches of Pixie Princess from Misa's Wishes collection to show you all. Pixie Princess is a light creamsicle color, and just like the other polishes from the Wishes collection, it's packed with lots of shimmer.The formula for this one was amazing. It went on super smooth and I only had to use two coats of it for full opacity. Late last night I was looking at my blog and I decided that I really didn’t like my background at all. For those of you who don’t remember what it looked like, it was a basically just a really dark gray color, and I just felt like it was really gloomy and my swatches looked terrible against it. After messing around with the template designer for awhile, I ended up changing my background and the overall layout of my blog. I think it looks nice and feel like it looks way less depressing than before. What do you guys think? Today I’m excited to show you guys some swatches of one of my favorite polishes! The polish that I’m talking about is Strobe Light by Sally Hansen from the Xtreme Wear Line. I have heard that this one is a dupe of OPI's Teenage Dream , but I’m unsure if that’s really true since I personally don’t own Teenage Dream. Strobe Light consists of a very light pink base (it’s so light it almost looks clear) with pink and silver holographic glitter. I’ve seen a lot of people layer this over another polish, but I really love to wear it alone. (To do this I usually will wear four coats) All of the glitter made this one really hard to get swatches of, and I don’t really feel like my pictures do it justice. I hope you’re all having a great Wednesday! Today’s kind of a boring day for me. I haven’t been getting many hours at work lately and with not having anything to do a lot of days, I just haven’t been feeling very motivated. I probably should be cleaning today, but I’m procrastinating and writing this post instead. Today, I have another summer nail polish to show you all. When I think of summer, I think of really bright and vibrant colors, which definitely describes Sally Hansen’s Marine Scene from the Xtreme Wear line . Marine Scene is a really bright teal blue color. This polish has a shimmer to it, which actually made it difficult to photograph in natural lighting. This one went on really well, and I ended up using two coats. Now that we’re about half way through August and fall will be here soon, I decided that I wanted to wear as many of my summer colors as possible when I can. Today, I’m wearing Green With Envy by Sally Hansen from the Xtreme Wear line. I have a lot of polishes from the Xtreme Wear line , because the formula of these polishes is usually pretty good and they’re super affordable. Green With Envy is a lighter lime green creme. This is a pretty bright color that’s perfect for the summer. This one was really easy to apply and went on super smooth. I ended up using two coats. For the first time ever, last night I tried water marbling, and I have to say, it was a complete disaster! I got my first nail to look really good, but no matter how many times I tried, I couldn’t get any of the other ones to look even somewhat decent. So, I got really frustrated and took everything off my nails and just decided to do something easy. I ended up putting on Borrowed and Blue by Essie and layered it with Twinkle, Twinkle by Sally Hansen from the Xtreme Wear line. 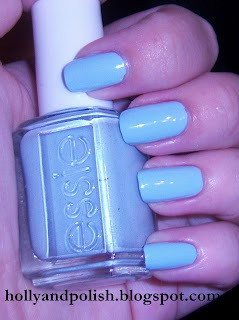 Borrowed and Blue is from Essie's 2011 Wedding Collection , and it’s a light sky blue creme. The formula for this one was pretty good. It was really easy to work with, but I had to use three coats to make it completely even. After putting on Borrowed and Blue, I topped it off with Twinkle, Twinkle, which I have a post on here.